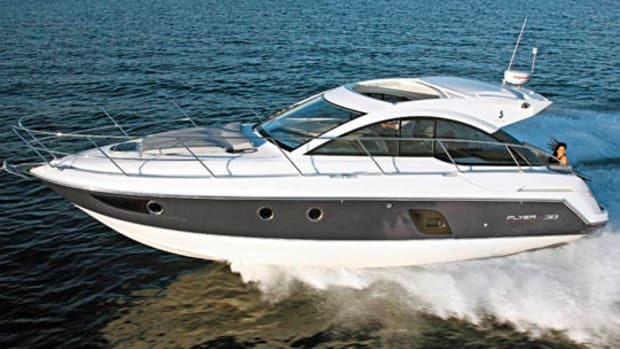 Our Boat Test of the Beneteau GT40. 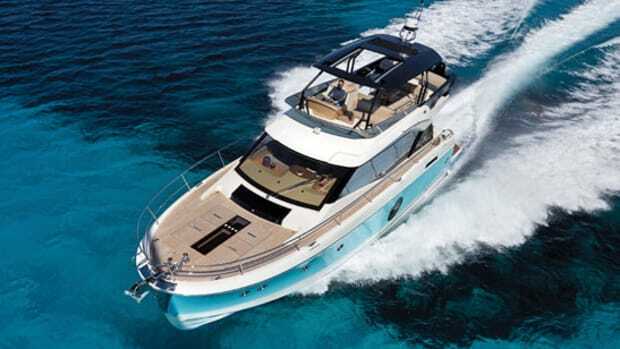 With its GT40, Beneteau is bringing a sporty, eminently usable boat with a noteworthy hull design to a U.S. market that should devour it. Every time I visit, I’m always struck by the natural beauty of Tampa Bay. It’s not a place normally associated with great national treasures like Yellowstone or Big Sur, but it has a charm all its own. Dolphins splash seemingly everywhere and sea birds frolic high above. It’s certainly a scene best taken in from the water, and not the shore. 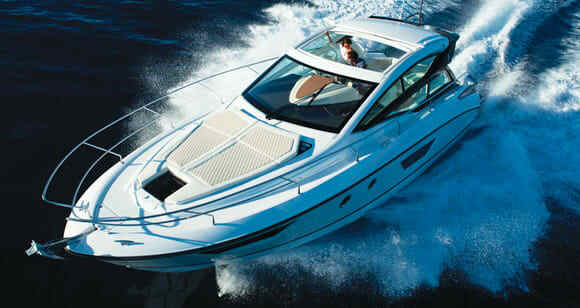 And that’s why I was so pleased to be able to test Beneteau’s new GT40 there this past winter. 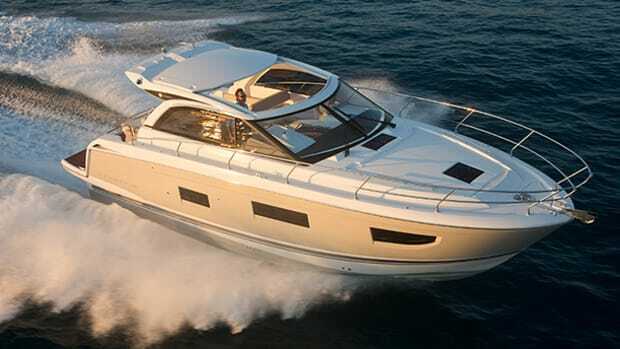 The GT40 is the first boat in Beneteau’s Gran Turismo line to be built from the hull up specifically for the U.S. market—and it shows. Amenities abound on board, as do spatial considerations for Americans with even the broadest shoulders. The passageway on the accommodations level is particular evidence of that last fact. Two people could pass each other down there without hardly having to turn at all. Other steps were taken to ensure this boat appeals to Americans as well. The cockpit is larger than what you’ll see on all previous Beneteaus in this series. There are more cupholders—clichéd as it may be, we Yanks really do like those things. And the helm is fully Americanized as well, with a glass cockpit system and no analog gauges. However, if you were to focus simply on what’s above the waterline on the GT40, you’d be missing a whole lot more than you probably realize. 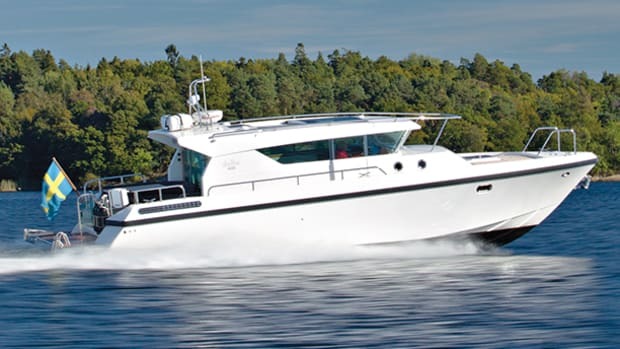 Beneteau has had its patented Air Step hull in rotation for quite some time now, but the GT40’s hull represents an evolution. Specifically, older Air Step hulls had air-intake tubes (in the hullsides a few feet above the waterline) that fed exhaust ports ahead of the hull’s single step. With the GT40, the company did away with the tubes, and instead dropped the air intake ports down to the chine, and shaped them almost like a cup. The result is 30 percent more air ventilating the step, which translates into a ride that is at once sporty and, indeed, cushy. Tampa Bay on test day was pancake flat, but after slicing a few wakes, I can say with a fair amount of confidence that the GT40 would be able to handle snotty conditions. Crossing the Gulf Stream from Florida to Bimini for example, would not be a concern, as long as the weather report was reasonable. Other construction notables on board include a hull that is fully balsa cored, even below the waterline. 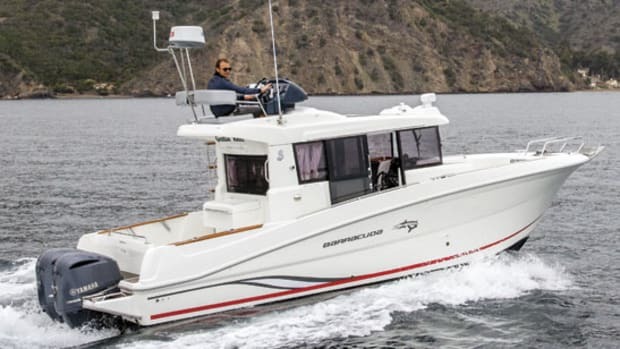 While that choice may not be exactly de rigueur these days, Beneteau says that once customers see the resulting weight and efficiency benefits its boats have over synthetically cored vessels, they’ll come around to see it the company’s way. 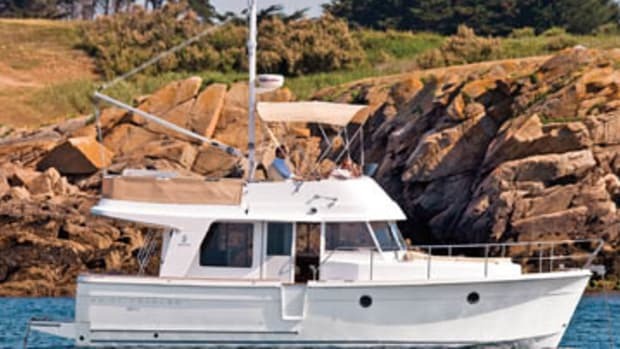 Beneteau also paid lots of attention to the vertical center of gravity on this boat, with all heavy components concentrated below the waterline, creating a sort of ballast effect that you can easily feel on deck. Stabilizing systems are available for the GT40, but it feels to me like an unnecessary option for all but those boaters most sensitive to seasickness. All the joinery on board the GT40 is also cored, this time with Alpi, a light, malleable material made up of multiple layers of compressed wood. Surfaces are veneered with either walnut, oak, or mahogany. Carving around out on the placid waters of Tampa Bay, the GT40 was a heck of a lot of fun to drive. She hit a very respectable 38.4 knots at WOT and a cruise of 30.8 knots at 3000 rpm burned 50 gallons per hour total. But where the boat really shines is her acceleration. 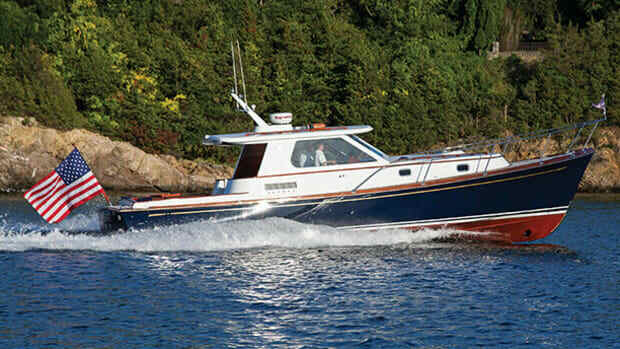 The twin, six-cylinder Volvo Penta D6-330s with outdrives fired the boat out of the hole, from idle to plane in just six seconds, while maintaining exceptionally balanced trim. I also clocked her from idle to 20 knots in 8 seconds, and idle to 35 knots in 19. Not too shabby. The GT40 is a dayboat. The main deck is open aft to let passengers enjoy the natural environment around them. 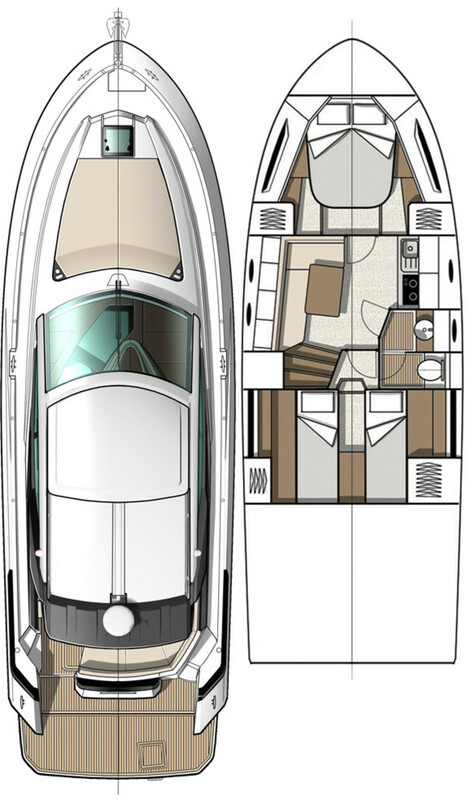 A large sunroof opens to about the midpoint of the space, and the side windows also lower to allow the area to take full advantage of days on the water. Another nice touch Beneteau put on this boat is a barbecue installed on the aft section of the transom, which allows the boat’s swim platform to become sort of like a whole other mini-deck. 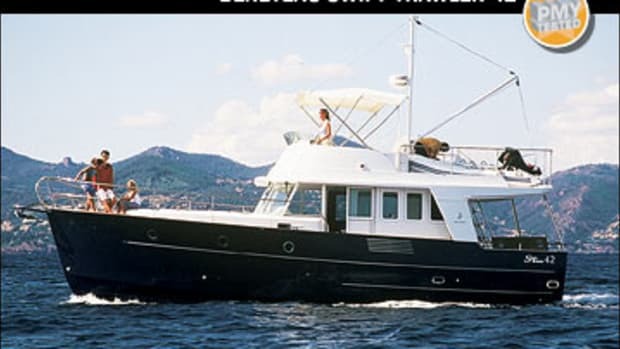 But the GT40’s concentration on outdoor enjoyment doesn’t mean she is one of those European dayboats that completely ignores usable accommodations. She has enough space down below to let owners and their kids or a guest or two spend a few nights in relative comfort. An L-shaped settee with dining table occupies the port side. It’s a de facto indoor dining room when coupled with the starboard-side galley, though more likely the area would be used mostly as a harbor in inclement weather. The forepeak master enjoys good natural light thanks to large side windows and feels roomier than it really is thanks to plentiful headroom even for my 6-foot frame. There’s also an amidships stateroom with twin bunks and a pleasing amount of stowage space. It’s a little bit cramped, as you might expect from a second stateroom on a boat this size—you wouldn’t want to spend much time beyond bedtime there—but for sleeping purposes, it’s more than suitable, and allows the owner to cruise overnight with guests. And being able to have friends aboard comfortably doubles the fun. 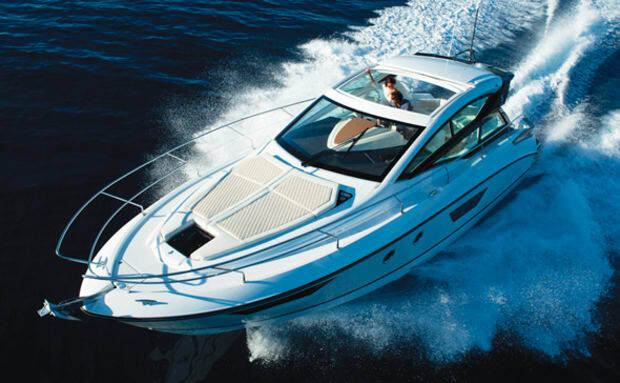 And fun is what the Beneteau GT40 is all about. 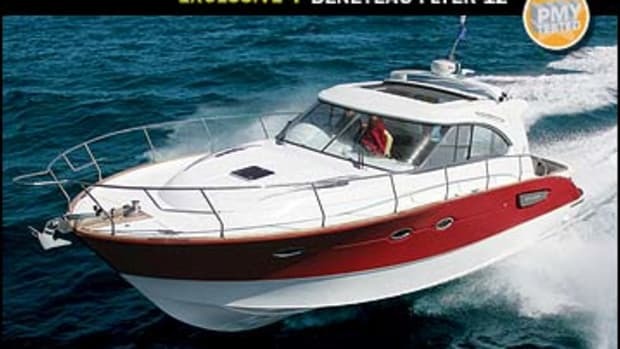 Click to see listings of Beneteau America Inc. Yachts currently for sale on BoatQuest.com. NOTEWORTHY OPTIONS: Electric swim platform, $11,920; Glendinning Cablemaster system, $6,240; Teak cockpit floor, $9,110; cockpit A/C, $7,920. 86 gal. fuel, 27 gal. water, 5 persons, 400 lb. gear.